Handbook of Mathematical Induction: Theory and Applications shows how to find and write proofs via mathematical induction. This comprehensive book covers the theory, the structure of the written proof, all standard exercises, and hundreds of application examples from nearly every area of mathematics. In the first part of the book, the author discusses different inductive techniques, including well-ordered sets, basic mathematical induction, strong induction, double induction, infinite descent, downward induction, and several variants. He then introduces ordinals and cardinals, transfinite induction, the axiom of choice, Zorn’s lemma, empirical induction, and fallacies and induction. He also explains how to write inductive proofs. The next part contains more than 750 exercises that highlight the levels of difficulty of an inductive proof, the variety of inductive techniques available, and the scope of results provable by mathematical induction. Each self-contained chapter in this section includes the necessary definitions, theory, and notation and covers a range of theorems and problems, from fundamental to very specialized. The final part presents either solutions or hints to the exercises. Slightly longer than what is found in most texts, these solutions provide complete details for every step of the problem-solving process. Which kind of induction is preferable? David S. Gunderson is a professor and chair of the Department of Mathematics at the University of Manitoba in Winnipeg, Canada. He earned his Ph.D. in pure mathematics from Emory University. His research interests include Ramsey theory, extremal graph theory, combinatorial geometry, combinatorial number theory, and lattice theory. … a treasure trove for anyone who is … interested in mathematics as a hobby, or as the target of proof automation or assistance. It could also be the basis for a crosscutting course in mathematics, based on seeing how one can apply a single proof technique across the field. 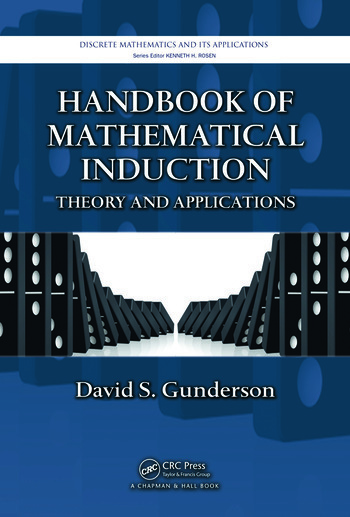 Gunderson started out collecting some induction problems for discrete math students and then couldn't stop himself, thereafter assembling more than 750 of the addictive things for this handbook and supplementing them with a grounding in theory and discussion of applications. He offers 500-plus complete solutions, and many of the other problems come with hints or references; unlike other treatments, this handbook treats the subject seriously and is not just a ‘collection of recipes’. It’s a book that will work well with most math or computing science courses, on a subject that pertains to graph theory, point set topology, elementary number theory, linear algebra, analysis, probability theory, geometry, group theory, and game theory, among many other topics.